Photograph provided by Joshua Burkheiser. Whether you are a new Wright State student or are returning, it is never too late to join a sorority or fraternity. If you are someone looking to volunteer your time, create a bond to last a lifetime and much more, consider the Lambda Chi Colony. Established in 1909, Lambda Chi focuses on friendship, community and the overall importance and meaning of togetherness. “Our core values are loyalty, duty, respect, selfless service, honor, integrity and personal courage. That transforms young men from when they come from high school into men when they go to graduate. A lot of our activities are social in nature but the events teach brotherhood,” said Joshua Burkheiser, president of Lambda Chi Alpha Colony. Joining a fraternity or sorority comes with many great benefits including volunteering, building relationships, the chance to raise money for great causes and much more. When it comes to fraternities and sororities, what you hear isn’t always what you get. “Greek life is not what you see on TV. It is very organized; there is zero hazing. Wright State and Lambda Chi is very against it. [All Greek community] is about a sense of belonging,” Burkheiser said. Joining a fraternity or sorority is great for people who like staying busy and being part of society. “With the strike going on, everyone is really pressed; it’s not that way in a Greek community. The entire Greek community bands together to try to help raise morale,” said Burkheiser. The requirements to join Lambda Chi are acquiring a 2.75 GPA out of high school and having a 2.5 or higher in your last semester of college. Members must maintain 2.5 or higher and/or maintain the all-men’s average. The first semester you join is $450 and each semester after that is $350. “To become alumni, you must finish your four years and graduate. Once you are in a fraternity, you’re in that fraternity for life,” Burkheiser informed. Among their many endeavors, Lambda Chi has a radio program to talk about events and interact with organizations and possible members. “We started a radio program called Chance Radio that I host every Friday from 1-2 p.m. Our radio show discusses everything that happens on campus. Any organization can come on and talk about their events or anything that’s going on. We [also] have scholarships that cover quite a bit of each semester you put in; an education system that’s based on merit,” Burkheiser added. 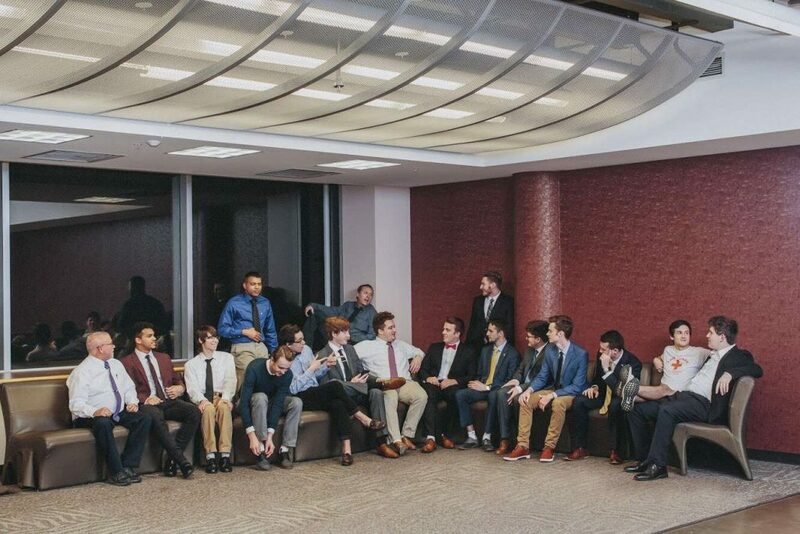 If you are interested in learning more about this fraternity, Lambda Chi is hosting several upcoming events that are perfect for prospective members: Top Golf on Jan. 31, Meet the Brothers on Feb. 4 from 5-6 p.m. at the Hangar and a dodgeball tournament on Feb. 11 and 12 from 4-6 p.m. in student union gym. “We wear our letters every Wednesday. You can pull us over any time if you see our letters; we are more than willing to talk to you,” Burkheiser said. Lambda Chi Alpha Colony currently has 15 members and is looking forward to welcoming any new perspective brothers. If you are interested in joining, the best time to join is during the fall rush when there are many events being put on. Apart from brotherhood events, majority are open to the public. An important highlight of this fraternity is the acceptance, openness and recognition that it gives its members. “We are a safe space organization. We are [also] one of the few that [accepts] transgender. If you identify as male, we can take you. We don’t care about your sexual orientation; we accept all races and religions. We are based in Christian ideals, but it’s not pressed in that way, it’s just in our symbology. Most people relate symbology to morals in general; we [care about] the morals. There are many [races] and faiths in our brotherhood,” said Burkheiser. Keep up with Lambda Chi Alpha Colony on Instagram, their website, Engage and CORQ.